On the western slope of mountainous Mexico is a beautiful lake resembling in size and surroundings the Lake of Geneva. It is called the Lake of Chapala, and as it is out of the beaten track, many visitors who feel that they have seen Mexico quite thoroughly fail to see that interesting place. To reach charming Chapala one must either take a steamer from the end of the lake, or leave the train at the station called Atiquiza, thirteen miles across the mountains. Then comes a drive over a road so full of bowlders and holes, hills and valleys, that the wonder is one has a bone unbroken in one’s body at the end of the journey…. Chapala is 400 feet lower than the city of Mexico. The lake is surrounded by mountains, which in that lovely atmosphere, so high and rarefied, take every shade of violet and pink and blue. The coloring is magnificent, and the sunsets and starlight nights are things to dream of. The Southern Cross is seen, and every star seems brighter and bigger and nearer, and the sky more filled with gems than one ever imagined. 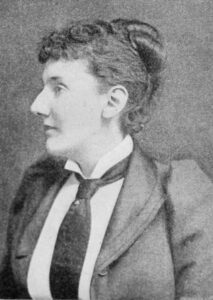 The details of Maud Pauncefote’s life have proved disappointingly elusive, despite her being the eldest of the four daughters of Sir Julian (later Lord Julian) Pauncefote, who was the British Minister in Washington (and subsequently the British Ambassador) from 1889 until his death in 1902. Sir Julian was senior British delegate to the First Hague Conference, and was nominated for the Nobel Peace Prize in 1901. Maud Pauncefote was born in Dresden on 1 June 1862, shortly after her father (a lawyer) had lost almost all his private fortune due to a bank collapse. The family sailed to Hong Kong later that year, where they remained for a decade before returning to England. Following her education in England, Maud was presented at court. In 1889, the Pauncefotes relocated to Washington D.C., where Maud, who loved the U.S., acted as hostess, alongside her mother Selina, at the British embassy. Curiously, Maud Pauncefote did not attend the huge society wedding in February 1900 of her younger sister Lillian to Mr. Robert Bromley, of the embassy staff. Among those attending “this brilliant affair” were President McKinley, members of his cabinet and the “entire diplomatic corps”. Pauncefote also wrote several short stories, including the (fiction) pieces entitled “The Silence of Two” in Munsey’s (1908) and “Their Wedding Day”, published in The Cavalier in 1909. This post is an updated version of the biography that appears in my Lake Chapala Through the Ages: an anthology of travellers’ tales (2008).